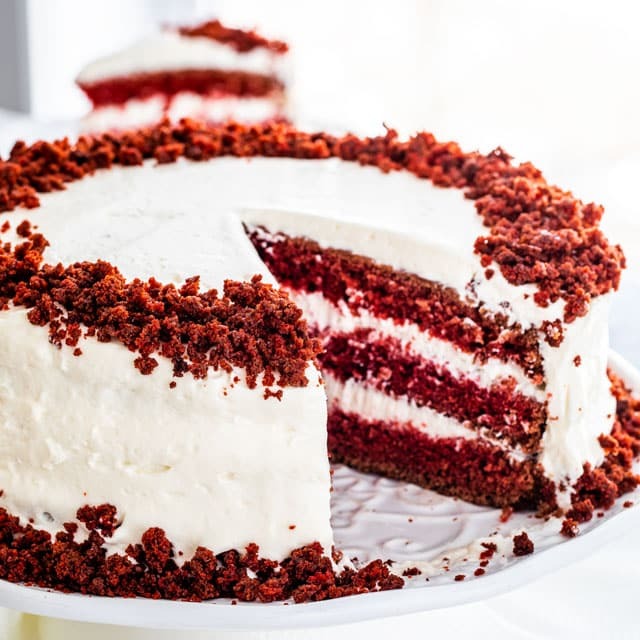 Red Velvet Cake with Cream Cheese Frosting – this super moist and tender red velvet cake makes for a divine and dramatic cake topped with an easy cream cheese frosting. We all have cake that we crave and is our favorite for all occasions. For me, red velvet cake is that cake. Whether I’m ordering dessert at a restaurant or I have to make it for a special occasion, I always turn to this classic. This really is my go-to cake! What takes this cake over the top is really that cream cheese frosting, which I think is just to die for. This is coming from someone who doesn’t like cake frosting. I don’t really like buttercream frosting because well they’re too buttery, I feel like I’m eating butter. But cream cheese icing is my kryptonite. It is traditionally a red, red-brown, or scarlet coloured chocolate layer cake topped with cream cheese icing. Usually red velvet cakes are made with buttermilk, butter, cocoa, vinegar and flour. 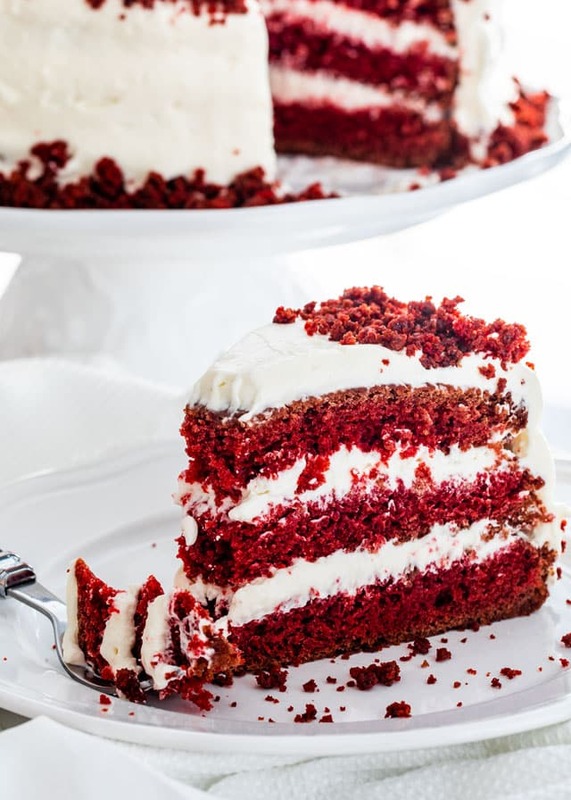 Red velvet cakes have been around since the Victorian Era and they used to be served as a fancy dessert. This red velvet cake recipe is basically an adaptation of my chocolate cake which I’ve been making for years. It’s a tried and true recipe, which I consider fool proof. This recipe has been perfected over the years, so I know it will work. My secret ingredient in this cake is the coffee which just enriches the chocolate flavor in the cake. You will not taste coffee at all. This cake is quite simple to make. I have made this cake before as a 3 layer cake or a 4 layer cake. If you make it a 4 layer cake, you’ll need only 2 cake pans. After you bake the cake, you’ll need to cut them in half so you can have your 4 layers. If you’re making a 3 layer cake, it’s easier to use 3 cake pans, 1 for each layer. While the cake is baking, it’s the best time to make the cream cheese frosting. This cream cheese frosting is a totally different story, at least in my eyes. 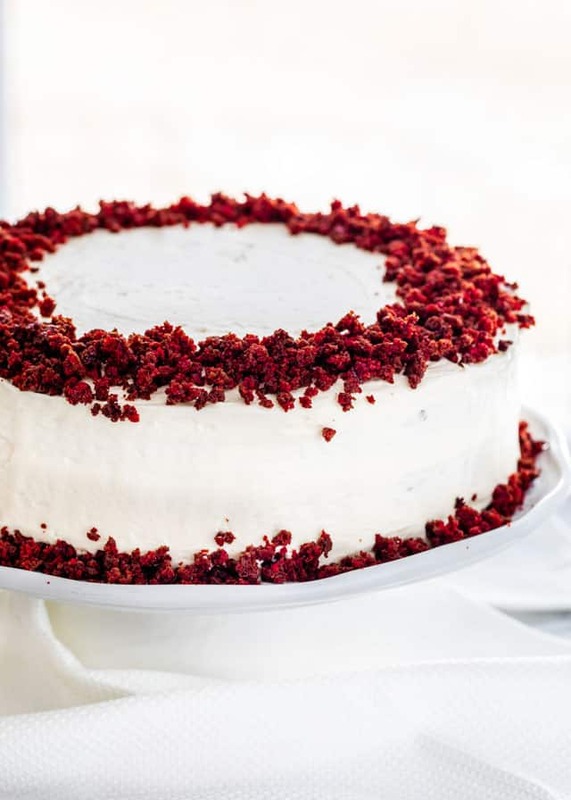 There’s no butter at all in this frosting, just cream cheese, icing sugar and whipping cream, which when mixed together creates the perfect cake frosting for such a gorgeous red velvet cake. All that’s left to do is assemble the cake which is pretty simple. Cake, frosting, cake, frosting and so on. Whatever frosting is left over use for spreading over the top of the cake. While many recipes will call for using cake flour for red velvet cake, I do not find that it makes a huge difference. While cake flour usually results in a softer more velvety cake, all purpose flour works just as well and this cake is still as soft. I used a red food coloring gel that I bought at Michael’s. 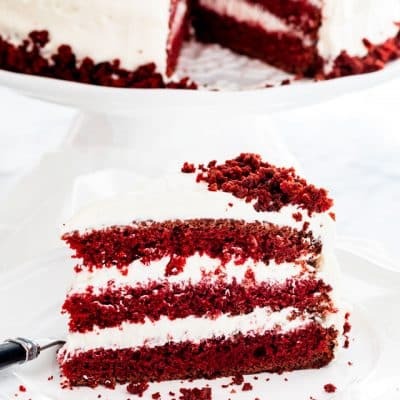 It gives me the perfect red color, or at least what I consider the perfect red color for a red velvet cake. A lot of people don’t want to use artificial food coloring, so you always have the option of using natural food coloring such as beets. I have used beets before to make red velvet cupcakes for a bake sale at work and they turned out great, although you don’t get quite the rich red color as you do by using red food coloring gel. I love to add a cup of strong coffee to chocolate cakes because coffee enhances the flavor of the chocolate. However, don’t worry, the coffee will not overpower the taste, you won’t even know it’s there. 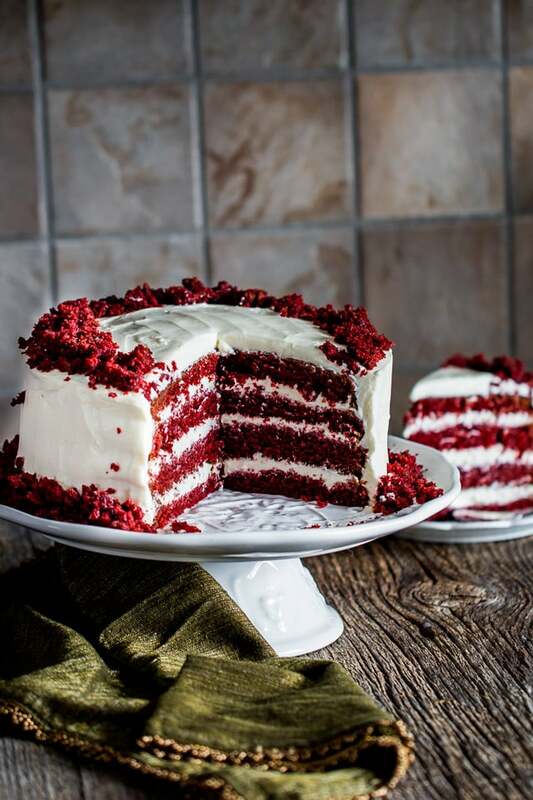 For another gorgeous red velvet cake give my Red Velour Cake a try! 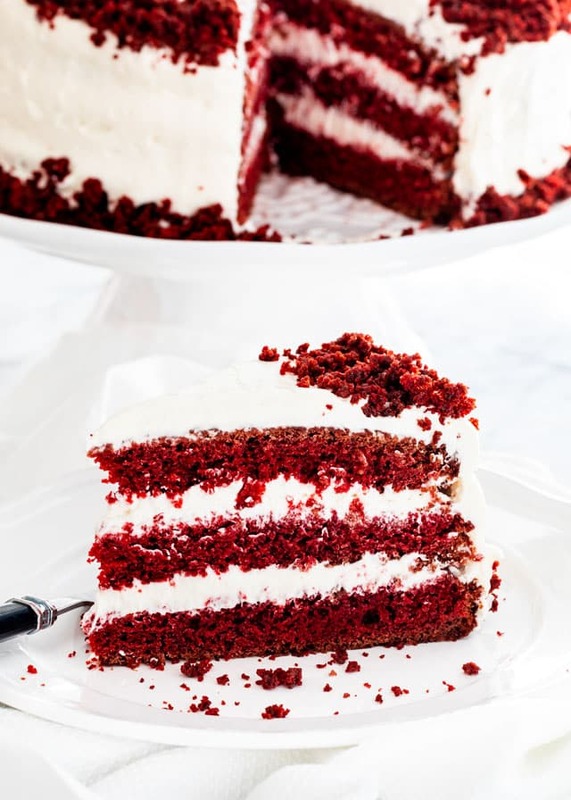 Red Velvet Cake with Cream Cheese Frosting - this super moist and tender red velvet cake makes for a divine and dramatic cake topped with an easy cream cheese frosting. Prepare the baking pans: Prepare 2 8 inch cake pans. Cut out 2 parchment paper circles that will fit inside each pan and spray them with some cooking spray. Make sure to spray some cooking spray up the sides of the pans too. Assemble the cake: Cut the top part of the cake first and crumbled it up in a bowl, we'll use this for decoration after. Cut each cake into 2 pieces. Start by placing 1 cake layer onto your serving cake platter, then spread some of the cream cheese frosting, about 1/4, evenly over the cake layer. Repeat with remaining cake layers. Using a spatula, spread the cream cheese frosting evenly over the top of the cake and up the sides. Decorate the cake with the remaining cake crumbs if desired. Why are you adding coffee to the cake and will it taste like coffee: Coffee is added to enhance the flavor of the chocolate and no, you will not taste the coffee in the cake at all. This cake can be made as a 3 layer cake or 4 layer cake. If making a 3 layer cake as seen in some of the pictures, it's easier to use 3 cake pans for baking the cakes, this way there's no need to cut each cake in half. Can cool whip be used instead of the heavy whipping cream? WE do not drink coffe. Hi, Just bought all the ingredients will be baking on Saturday for my husbands birthday, do you mean 11/2 cups of whipping cream before whipping? Have you ever tried adding frozen raspberries, just thought I might give it a go but don’t want to ruin the cake? Yes, that’s correct, 1 1/2 cup whipping cream while it’s still liquid. I haven’t tried adding frozen raspberries, do you mean in the cream cheese layers? I might go with fresh raspberries instead. I want to try this recipe as it seems delicious! However can I replace coconut oil with something else? Sure, you could use vegetable oil. Gave this recipe a try and it came out super awesome although there were little glitches. I don’t know if the coffee affected the colour but I emptied my bottle of Wilton’s red food coloring gel and even added a little of mekang colouring yet it still wouldn’t give me that bright red colour it looks more like a chocolate cake tinted with a little but of food coloring, please help!!!!! I’m guessing you’re in Nigeria, cause that’s where Mekang products are sold. The coffee in the recipe doesn’t affect the colour. I’m certain what happened to your cake is the choice of colouring. Most Wilton products sold in Nigeria are counterfeit. You could empty 3 bottles in this recipe and the colour wouldn’t change a bit. Mekang, on the other hand, doesn’t colour cake at all. I recommend you try the recipe with Rayner’s liquid food colouring. Most effective this side of the world. Two teaspoons should be sufficient. I made this cake as well for a birthday, and the cake turned out light brown not red. I had the same problem. I used red food coloring gel as directed by the recipe and the cake was not red. Cake tasted great. I added a little more powdered sugar to the frosting since I thought it was too tangy. Is it possible to substitute the coconut oil with canola oil? You could certainly change that out. Hi jo! I used this recipe because your cream cheese frosting had the least amount of powdered sugar among the recipes I’ve seen on the net. I don’t like cakes that are too sweet. I made this for the first time last week and it turned out great! <3 My friends and family absolutely loved it. I actually have a friend who is willing to pay me to make this cake for her. Thanks for this great recipe! I have a question though. Is it ok if I use instant coffee dissolved in 1 cup water instead of using 1 cup of brewed coffee? Would it change the cake? Hi, Jo! Have you ever tried this with gluten free flour? It sound delicious, but I’m allergic to wheat.? Does it raise much? P. S. It would be VERY easy to make vegan! Making this right now…. it’s super watery…. is that to be expected???? Not sure what you mean but super watery, but it is a wet batter, you can check out the recipe here, the cake batter is similar and there are more step pictures there. Silly question…isn’t coconut oil a solid? Not familiar with it that much….Do you measure it melted or as a solid? And when adding to ingredients, add it melted or solid? You can find it as oil and as a solid, I usually buy the oil form that comes in bottles, and that’s what I used here, so I would melt it first and measure it that way. Can you taste the coffee in this recipe? I am not a coffee fan. If so what can I substitute for the coffee. Not really, it just gives it a rich flavor. Wow! For the cocoa powder, should it be sweetened or unsweetened? And for the whipping cream, would you use heavy whipping cream that comes in a milk carton or something like cool whip? Unsweetened cocoa powder and the whipping cream is the one that comes out of a milk carton, but you could use cool whip too! It will probably be a bit brown, but I would add more cocoa powder to make a chocolate version instead or omit the cocoa powder completely for a white vanilla cake. Thanks so much for responding so quickly. Is it safe to keep the coffee ingredient? Absolutely, especially if you’re going for the chocolate cake version. If you’re making a white cake I’d maybe just use 1 cup of milk. I just made this today for my son’s 10th birthday. OMG! He and some family members passed up a piece of mocha cake for this instead- and it was so worth it!!! 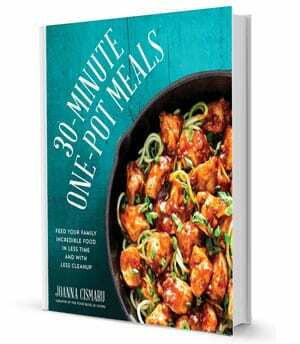 Hi Jo, I love your recipe!! 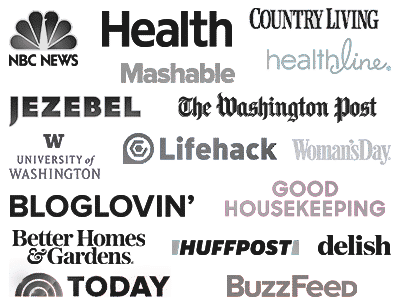 A quick question – what can I replace buttermilk with? Thanks!! Oh Jo, it looks delicous.I already decided on cake forValentines day but gthis must be next! You’ll love it, I had to give most of it away to a friend so I wouldn’t eat the whole thing. It looks perfect! And I love cream cheese frosting too, way better than pure butter and sugar. And the whipping cream sounds great as well, I have to try this. Thanks Adina, hope you do!